Mom Among Chaos received tickets to facilitate this post. All opinions are 100% my own. This blog contains affiliate links. 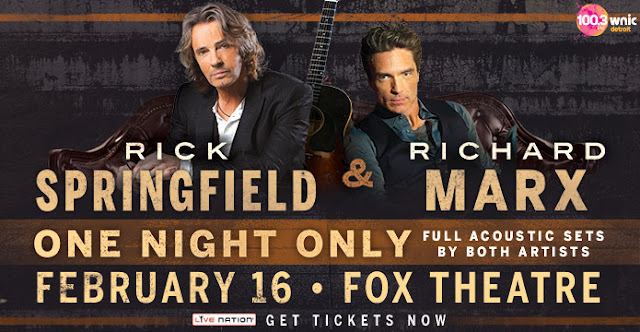 Two incredible performers, three decades of hits, one night only. 100.3 WNIC’s Jay Towers presents “An Acoustic Evening with Rick Springfield and Richard Marx” as the pair join forces to bring their catalogues of hits to the Fox Theatre featuring full solo acoustic sets by both artists on Thursday, February 16 at 7:30 p.m.
Tickets ($25, $35, $55 and $99.50) are on sale now and can be purchased at OlympiaEntertainment.com, LiveNation.com, The Fox Theatre and Joe Louis Arena box offices, Hockeytown Authentics in Troy (without service charge) at all Ticketmaster locations and Ticketmaster.com. To charge tickets by phone, call (800) 745-3000. For additional information, call (313) 471-6611. Rick Springfield has created of some of the finest power-pop of the ’80s. As a Grammy-winning singer, songwriter, and musician, Springfield has sold 25 million albums and scored 17 U.S. Top 40 hits, including “Jessie’s Girl,” “Don’t Talk to Strangers,” “An Affair of the Heart,” “I've Done Everything for You,” “Love Somebody,” and “Human Touch.” He’s an accomplished actor who most recently starred opposite Meryl Streep in the feature film Ricki and the Flash and gave a chameleonic performance as the creepy Dr. Pitlor in HBO’s prestige drama True Detective. In 2014, Springfield was honored with a star on the Hollywood Walk of Fame, located around the corner from the first apartment he lived in when he first arrived in the U.S. from Australia in 1971. As a performer, Grammy-winning singer, songwriter, and producer, Richard Marx’s career has had numerous highlights. The Chicago native has sold more than 30 million albums worldwide, including chart-topping hits “Hold On To the Nights”, “Don’t Mean Nothing”, “Satisfied”, “Right Here Waiting”, “Keep Coming Back”, “Hazard” and #1 AC hit “Now And Forever”. When both Rush Street and Paid Vacation albums went platinum, Marx achieved a seven-year string of triumphs that rivaled any in pop-rock music history. To this day, he is the only male artist to have his first seven singles reach the Top 5 on the Billboard charts.